This 1930's vintage desk is designed after George Washington's famous desk in New York City Hall. 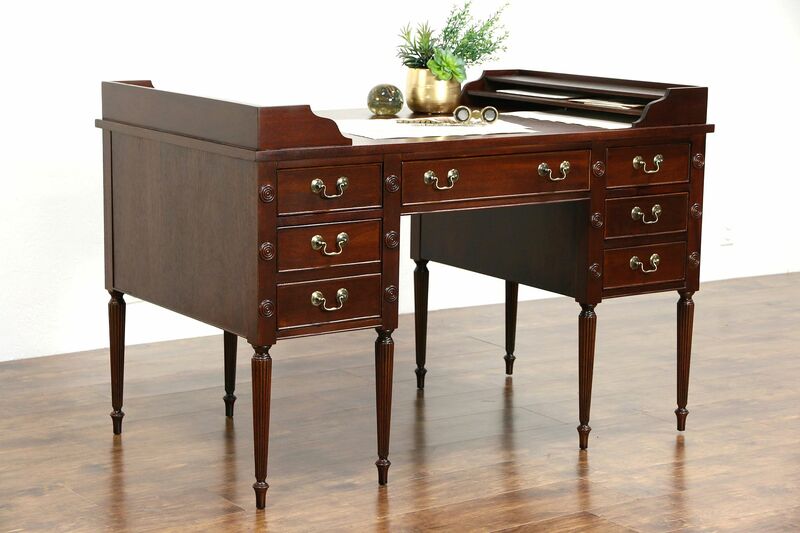 Matched grain mahogany with delicate reeded legs, the restored lustrous finish is in excellent condition. Drawers have solid oak sides and original embossed pulls. The other side has matching hardware on faux drawers. American made library furniture, there is no maker's signature. Dimensions are 50" wide, 30" deep, 34" tall to the top of the letter holders, the work top is 30" high and the kneehole is 21" wide and 24" high.